Ltd., of Johannisthal, Berlin, as a result of their experience with an earlier type of similar lines, the L.68. 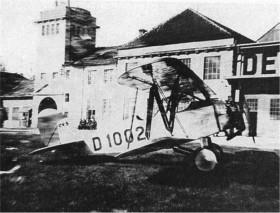 The new machine, whose series number is L.68A, is intended for school work and for sporting and demonstration flying. In order to fit it for the latter, it has been designed with rather higher factors of safety than usual. The L.68a is, it will be seen, characterized by a fairly heavy stagger of its biplane cellule, and as regards its lines looks singularly " un-German," resembling much more a British machine in its general layout. It is a rather curious fact that of recent years there appears to have been in Germany a reversal to the biplane type, which once upon a time was far less popular than the monoplane, but which again seems to be coming into its own for smaller machines. Large German aircraft is still almost entirely of the monoplane type. 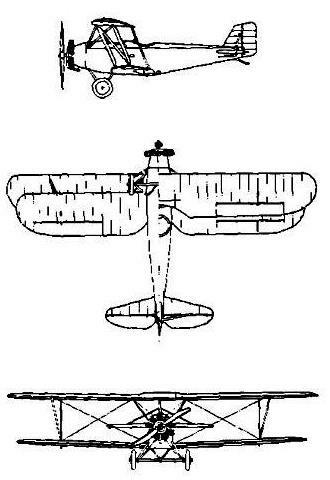 There can probably be no gainsaying the fact that weight for weight the biplane structure is superior to the monoplane from a strength point of view, and even aerodynamically it is very doubtful whether the monoplane, and particularly the cantilever monoplane, is really as efficient as its apparently " clean " lines might lead one to suppose. In the Albatros L.68A Herr Schubert, the Albatros chief designer, has been content to follow orthodox lines, and the machine presents no unusual features aerodynamically if we except the fitting of slot-ailerons. In connection with these it should be noted that the ailerons do not extend right out to the rounded wing tips, but stop short approximately where the wing tip curve merges into the straight trailing edge. At the inner end also, the ailerons do not run right up to the fuselage (in the case of the bottom wing), nor to the top centre-section, but are altogether of relatively short length, and, it would seem, to some extent inefficiently placed in that their already short span may be rendered less effective by so placing them that they work on a relatively short lever arm. However, so far as we know the machine has very good lateral control, so that presumably the extra effectiveness of the slots makes up for the short distance of the lateral centre of pressure from the centre line of the machine. 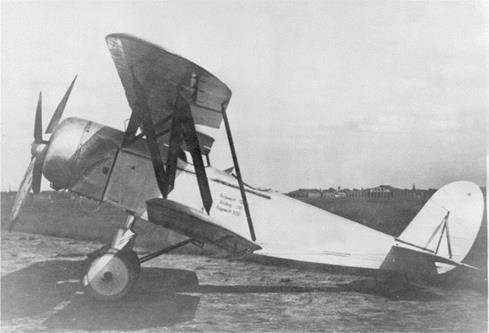 The Albatros L.68A is of " mixed " construction in that the wings are of all-wood construction, while the fuselage is a steel-tube structure covered with fabric. In section the fuselage is of the flat-sided variety, but with a slightly cambered deck. The tail members are also of metal construction, the structure members being arranged to give triangulation. 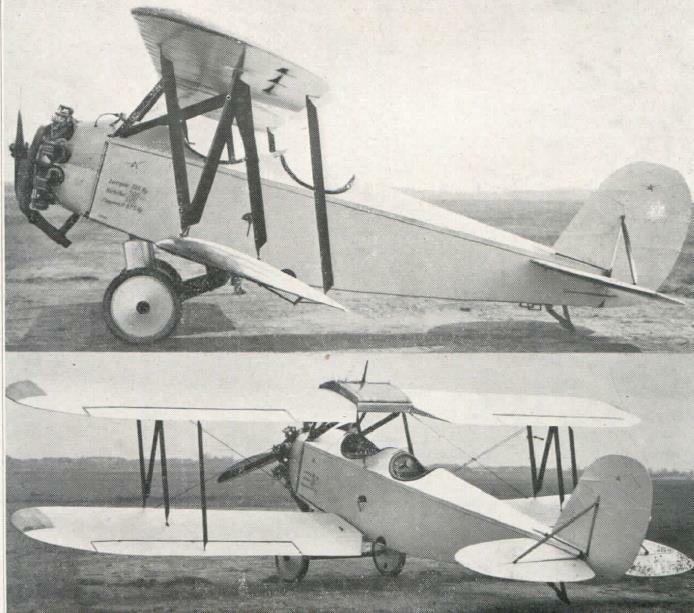 The tail plane is of the trimming type, its rear spar being braced by struts to the fin, and the front spar being elevated or depressed for trimming. The tail skid, it might be pointed out, is so mounted as to steer with the rudder in order to make the machine easy to taxy in a wind. The wing structure, as already mentioned, is of all-wood construction, the planking being in the form of three-ply, which extends from the leading edge up to the false spars carrying the ailerons. Near the fuselage and top centresection, however, the three-ply planking only extends to the main rear spar, the remaining portion aft to the trailing edge being fabric covered, presumably in order to save weight. Streamline steel tube interplane struts with incidence adjustment are arranged in the form of a letter N, and top and bottom ailerons are connected by a strut on each side. The top centre-section is of fairly large span, and is swelled to accommodate the gravity petrol tank. 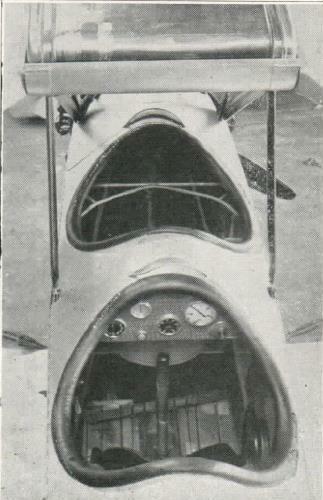 The trailing edge of the centre-section is cut away to the rear spar, and the petrol level indicator is mounted on the rear face of the spar where it can be read from both cockpits. The undercarriage is of simple Vee type, with rubber rings in compression forming the shock absorbers in the telescopic front legs. There is an oleo dashpot arrangement for checking bouncing. The 100 h.p. Siemens radial air-cooled engine is mounted on a swivelling engine plate, which gives easy access to the back of the engine. The petrol feed is, as already stated, by direct gravity flow from the tank in the top centre-section. This tank has a capacity sufficient for four hours' flying. 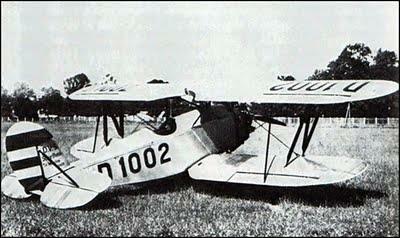 As regards the two cockpits it may be mentioned that these are of generous proportions, and allow of the occupants employing, if they wish, parachutes of the pack type. The seats of both cockpits are adjustable. of the Albatros L.68A :-Length o.a., 6-3 m. (20 ft. 9 ins.) ; span top plane, 10-1 m. (33 ft. 2 ins.) ; span, bottom plane, 9-05 m. (29 ft. 9 ins.) ; wing area, 24-4 m.2 (263 sq. ft.). Weight of machine empty, 655 kg. (1,440 lbs.) ; useful load : pilot and passenger, 1760 kg. (352 lbs.) ; petrol, 100 kg. (220 lbs.) ; oil 15 kg. (33 lbs.) ; disposable load, 25 kg. (55 lbs.) ; total useful load 300 kg. (660 lbs.) ; total loaded weight, 955 kg. (2,100 lbs.). Wing loading, 39-8 kg./m2. (8 lbs./sq. ft.) ; power loading, 9-5 kg./h.p. (21 lbs./h.p.). Wing-power, 4-1 h.p./sq.m. (0-38 h.p./sq.ft.) Top speed, 140 km./h. (87 m.p.h.). Climb to 1,000 m. (3,300 ft. in 12 minutes. "Loading-figure" (metric), 59-9", (British), 59-4). The " loading-figure " is the power loading multiplied by the square root of the wing loading. A very simple straightforward machine is the small two-seater light biplane exhibited by the Albatros Flugzeugwerke. Known as the tvpe L 68 c, this machine is characterised by a very pronounced stagger, but is in all other respects a perfectly norma! 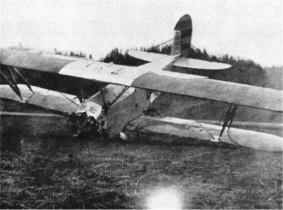 biplane of " mixed " construction, i.e., with steel-tube fuselage and wood wings. The wings are largely covered with ply-wood, i.e., the entire under surface and the leading edge, while the top rear portion of each wing is fabric covered. The engine fitted as standard is the Siemens S.H.I2 radial air-cooled of a normal power of 120 b.h.p. It is. however, stated that other engines of approximately the same power and size can be substituted if desired. An engine mounting of the swivelling type is used in order to facilitate access to the back of the engine. The L. 68 c is reported to be very manoeuvrable and to have good controllability, thus being suitable not only for school work but also for practising aerobatics, etc. 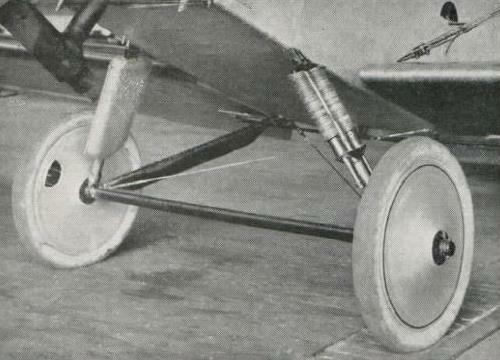 The tailplane is of the trimming type, a feature not always found in German aircraft of this small size and power, and the under- carriage is also up to the best modern standard, with rubber compression blocks absorbing the shock, and oil damping preventing bouncing. 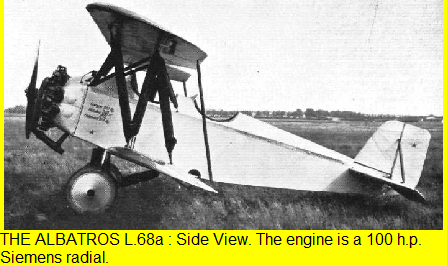 Albatros bringt mit dieser Type L68c „Alauda" eine Weiterentwicklung der bisherigen Type L68a (siehe Flugsport 1926, Heft 18, Seite 354). Der Zweisitzer ist wieder als verstrebter Doppeldecker ausgeführt und gleicht in vielen Einzelheiten den vorhergegangenen Typen. Infolge seiner guten Flug- und Landeeigenschaften ist er als Schulflugzeug für Anfänger besonders geeignet, kann aber auch als Uebungsmaschine für den Figurenflug und als Reiseflugzeug für mittlere Entfern ungen verwendet werden. Der Aufbau der Flügel ist in Holzbauweise mit zwei Kastenhohnen durchgeführt. Flügelnase und Unterseite wurden mit Sperrholz beplankt, während die Oberseite mit Stoff bespannt ist. Bei dieser An- ordnung konnte auf eine Innenverspannung verzichtet werden. Die Ebene Oberflügelhinterholm-Unterflügelvorderholm ist mit Doppelverspannung aus Stahlseilen versehen. Die Streben sind als kräftige N-Stiele ausgeführt. Skala angezeigt wird. Durch diese Anordnung ist ein jederzeitiger Lastausgleich möglich. Die Fahrgestellkonstruktion wurde verbessert, als Druckgummifederung mit Oeldämpfung. Bauart „Albatros", ausgeführt, wobei eine durchgehende Achse verwendet ist. Der Sporn, der mit Teleskop-Spiralfederung ausgestattet ist, ist mit dem Seitenstetier zwangsläufig verbunden, eine Anordnung, die Bodenbewegungen sehr erleichtert. Die Maschine kann mit Siemens Sh 11, Sh 12, Armstrong Siddeley Mongoose oder ähnlichen Motoren ausgerüstet werden. Der Rumpfbug wurde abnehmbar und mit Scharnier abklappbar ausgeführt. Der im Baldachin untergebrachte Brennstoffbehälter faßt 115 l, davon befinden sich 15 l in einem Notbchälter. 25,07 m2, Leergewicht 595 kg, Zuladung 280 kg, Fluggewicht 875 kg, Höchstgeschwindigkeit 135 km/Std., Landegeschwindigkeit 70 kin/Std., Steigzeit auf 1000 m 9,3 Min., auf 2000 m 23,7 Min., Steiggeschwindigkeit 0,5 m/Sek.